Online test over file types and file extensions. 10 grade Information technology evaluation. Computer science test. 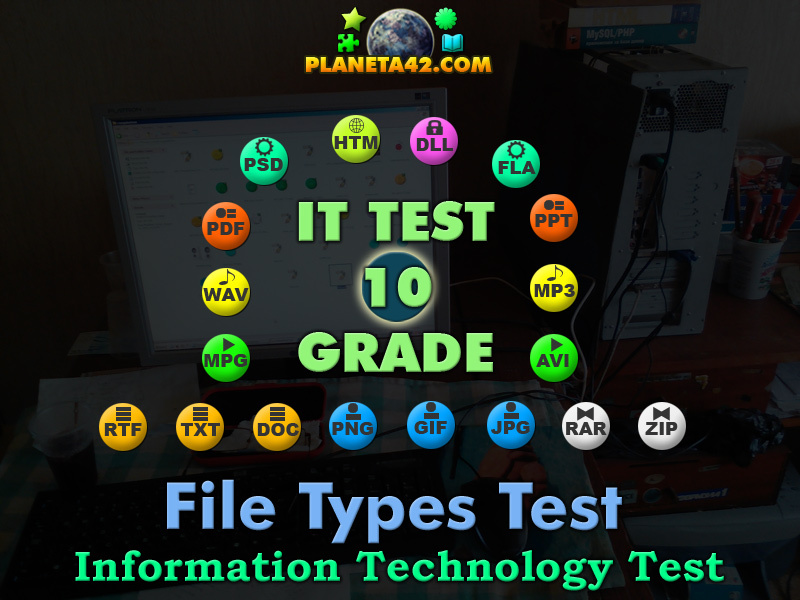 "File Types Test" is a free online knowledge level test for IT 10 grade, about popular file extensions and what programs recognize these files to open, play or run them. A small 18 question interactive test for desktop computers, laptops and tablets, which may be solved online in the web browser. The IT Knowledge Board include 18 fun questions with integrated evaluation system. It is cumulative with the File Types Tree game. 10 grade classes for evaluation or theoretical lessons. How to play File Types Test. Read carefully the question and select one of three answers. Some questions may have more than one correct answer. Entrance level before database and presentation files creation. 1. DOC - What program opens DOC files? 2. TXT - What program opens TXT files? 3. RTF - What program opens RTF files? 4. JPG - What program opens JPG files? 5. GIF - What program opens GIF files? 6. PNG - What program can modify PNG files? 7. AVI - What program can play AVI files? 8. MPG - What program can play AVI files? 9. MP3 - What program can play MP3 files? 10. WAV - What program can play WAV files? 11. PPT - What program can create PPT files? 12. PDF - What program opens PDF files? 13. ZIP - What program opens ZIP files? 14. RAR - What program opens RAR files? 15. PSD - What program opens PSD files? 16. FLA - What program opens FLA files? 17. DLL - What program use DLL files? 18. HTML - What program opens HTML files? Labels: IT Tests , Test Games , Flash Games , Online Tests , Education Games , Free Online Tests.